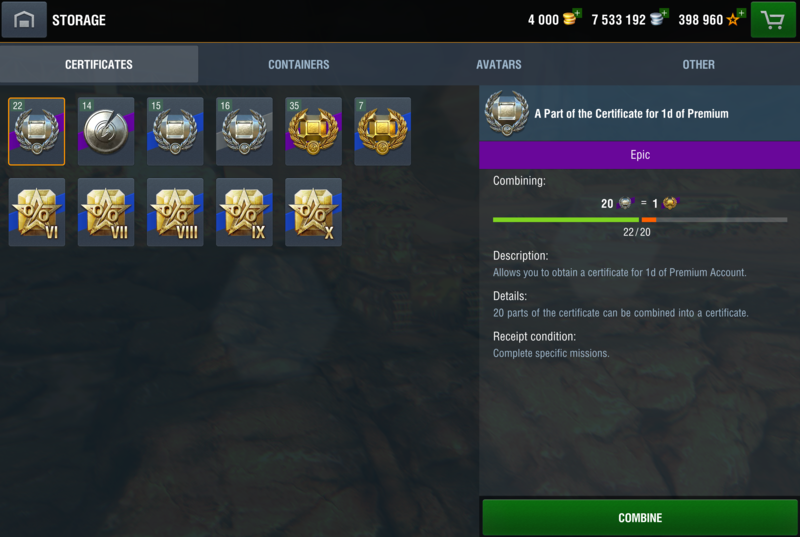 A rare certificate for researching Tier VI vehicles (50% less XP). A rare certificate for researching Tier VII vehicles (50% less XP). A rare certificate for researching Tier VIII vehicles (50% less XP). A rare certificate for researching Tier IX vehicles (50% less XP). A rare certificate for researching Tier X vehicles (50% less XP). I was not happy to say the least as there was not clear communication on the fact that they were deleted when the event ended, so I lost them and that was that. After being very upset about this lack of information in the event, I complained further, as I really was looking forward to using, since I did earn them following all of the requirements. Fortunately in my case after a lot conversation with customer service and escalating my ticket, they decided to return them back to me (minus the other rewards - still not sure how I was supposed to receive/accept them). I was ready to quit the game even though I had Prem time, etc. as I was very frustrated. I stopped playing immediately, didn't even log on to game. I was going to by the 3700 gold, to put towards the purchase the Bulldog that was offered for 5 days just recently, but by the time this ticket was resolved, the sale was over, so now, Blitz does not get my money just yet, not until I see a worthwhile tank to get. and of course a very good paying customer (me, a mature gamer) upset and frustrated about the situation. Cant tell if this is a troll or just a very sad story. The 50% certificates don't get deleted. I still have mine after the event. When WG say the items were "deleted" I dont think it means they were magically removed... I think it means you used them. I could be wrong, but its more likely that you accidentally used them without noticing rather than WG fcked up and deleted your certificates and specifically only yours. Doesnt seem realistic. It is very easy to accidentally use them when buying a new tank so, you may have been buying a new vehicle and just clicked "buy" then when the pop up to use the 50% certificate came up you just clicked yes really quick in anticipation for your new vehicle without reading the text. Maybe you just thought it was a "are you sure you want to buy this vehicle" question and skipped it to get to the new tank quicker. Edited by CK_GoldenNuggets, 25 October 2018 - 02:30 PM.